Chemistry X | Metals and Non-metals | How do Metals react with Solutions of other Metal Salts? Take a clean wire of copper and an iron nail. 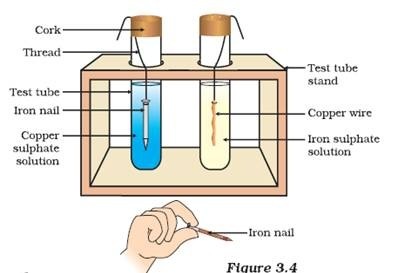 Put the copper wire in a solution of iron sulphate and the ironnail in a solution of copper sulphate taken in test tubes (Fig. 3.4). Record your observations after 20 minutes. In which test tube did you find that a reaction has occurred? On what basis can you say that a reaction has actually taken place? Can you correlate your observations for the Activities 3.9, 3.10 and 3.11? Write a balanced chemical equation for the reaction that has taken place. Name the type of reaction. Reactive metals can displace less reactive metals from their compounds in solution or molten form. We have seen in the previous sections that all metals are not equally reactive. We checked the reactivity of various metals with oxygen, water and acids. But all metals do not react with these reagents. So we were not able to put all the metal samples we had collected in decreasing order of their reactivity. Displacement reactions studied in Chapter 1 give better evidence about the reactivity of metals. It is simple and easy if metal A displaces metal B from its solution, it is more reactive than B. Which metal, copper or iron, is more reactive according to your observations in Activity 3.12? 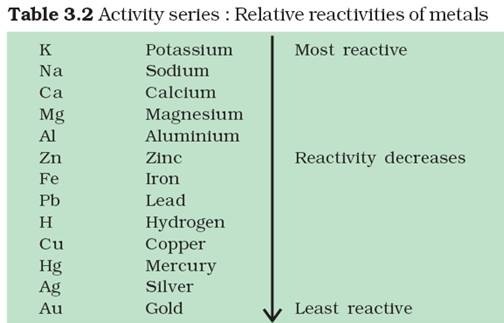 The reactivity series is a list of metals arranged in the order of their decreasing activities. After performing displacement experiments (Activities 1.9 and 3.12), the following series, (Table 3.2) known as the reactivity or activity series has been developed.